The tattoo is an art of expression through which you can express the untold feelings and meaningful stories. Though women prefer to get tattoos in any visible spot on the body, due to the attraction factor, most men prefer to get the tattoo on their sleeves. 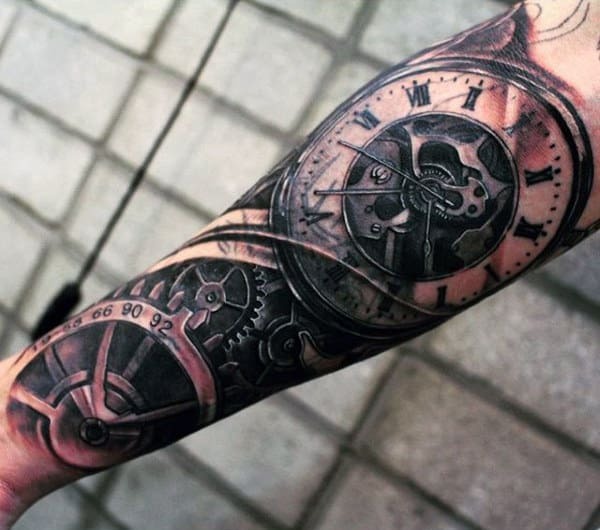 It is the reason why we came up with the 10 most mesmerizing tattoo sleeve ideas for men here. These sleeve tattoo designs start from shoulder and flow down towards the forearm. May it is a half sleeve tattoo design or a full sleeve tattoo design; it will look fantastic on the men with well-built body structure. Unlike the smaller tattoos, big tattoos need lots of patience and a high pain endurance. Remember, getting yourself a tattoo is a lifetime decision. It should satisfy you even after the decade from the time it’s inked.From flower to dragon, there are lots of tattoo designs are available to try upon. 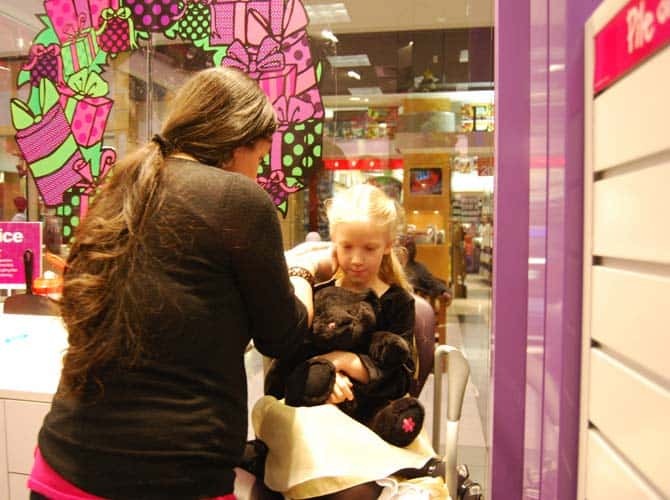 Take time to research; find a perfect design that fits your personality and a personal taste. 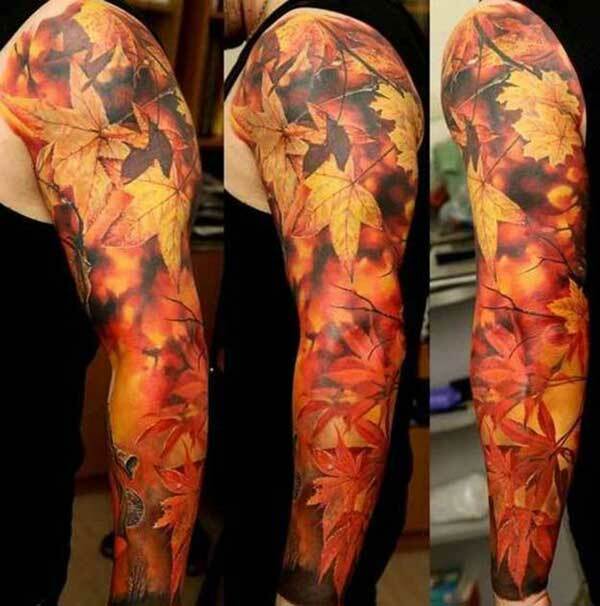 Now, do you want to have a look at some of the best sleeve tattoos that are popular over the internet? Scroll down to see now. 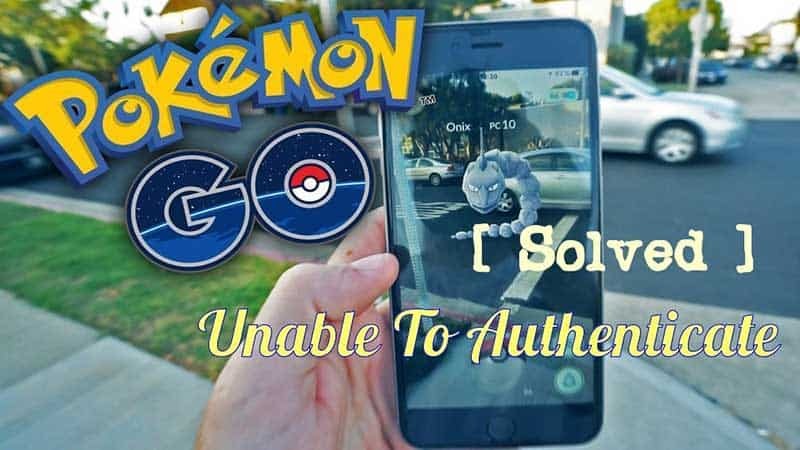 Since Half sleeve and full sleeve tattoos are time-consuming and require expert skills, tattoo parlors can charge you anywhere from $500 to $3000 per hour. However, once you decide to get a tattoo, cost should not be your main concern. If you want to get 100% satisfaction, go with an artist with years of experience. For those who have a close relationship with chasing the ocean and ship, this tattoo is a perfect choice to be inked on the sleeve. 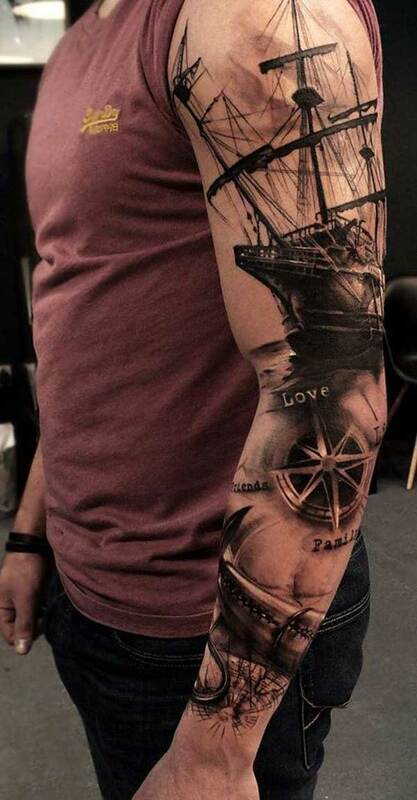 For a sailor, this design is the best which portrays their love for the ship, water, family, friends and their work. It also denotes the love for adventure; hence a perfect fit amongst the non-sailors as well. The anchor in the tattoo represents stability and strength. No doubt why the tattoos are so popular among the marine workers and the sailors, it shows their strength to tackle hardships of life with a stable mind. Some people make the ship and sea tattoo if they have survived any disaster in the middle of the blue water surface. 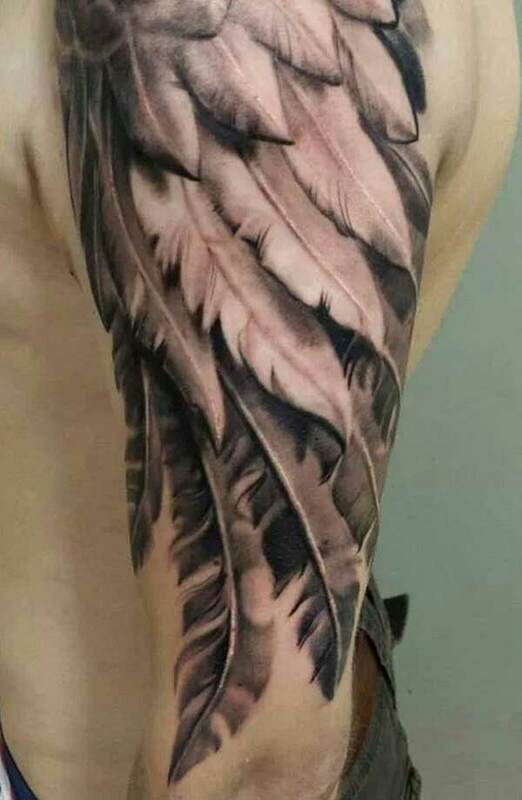 Wing tattoo designs for men are amazing. Wing tattoo denotes that the person who inked it on his sleeve believes in freedom and movement. It can also be inked to emphasize the loving memory of your loved ones. Wing tattoos are a perfect fit for those who dream to fly high and have the will power to achieve anything in life. Equal geometric shapes just look classic on the sleeves. Well-built arms with the geometric design are everything you need to create your exclusive personality. Geometric designs are popular from last few decades and it does not seem to go out of fashion in anytime soon. The bold lines and the shaded parts offer a unique style to the inking art. The detailing of the design requires a great patience but the outcome will be really fantastic. There is no substitute to the gorgeous geometric tattoo art which depicts the balance and harmony of the dark and light phases of life. Mandala tattoos are the most visually appealing ones. They look pretty amazing and the detailing of the tattoo work makes them exclusive. The design is made from center to outwards and thus, it creates a floral design. The floral designs are usually circular in appearance. 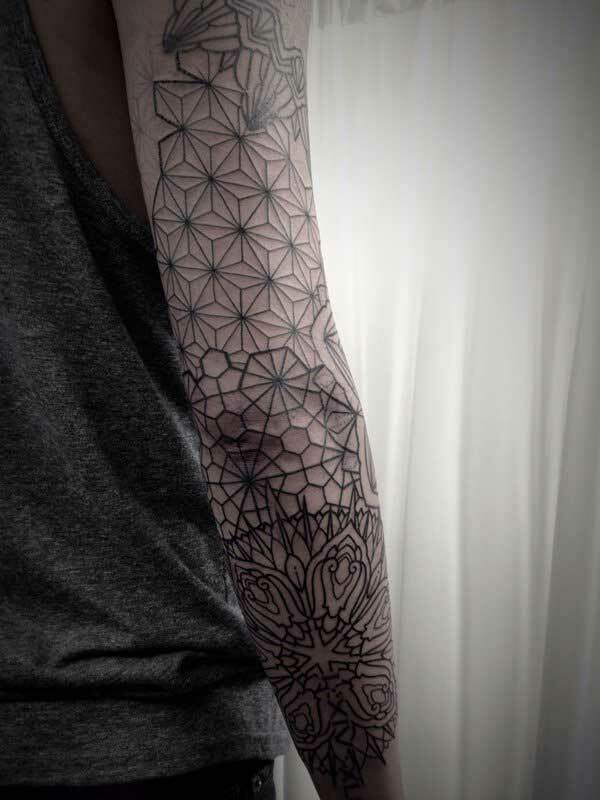 The meaning of mandala tattoo varies widely and is highly considered as a tool to the person’s spiritual journey. This tattoo has deep roots to an individual’s spiritual life. The wide range of variations can be made in the design and a personal touch can be added to any mandala tattoo’s design. 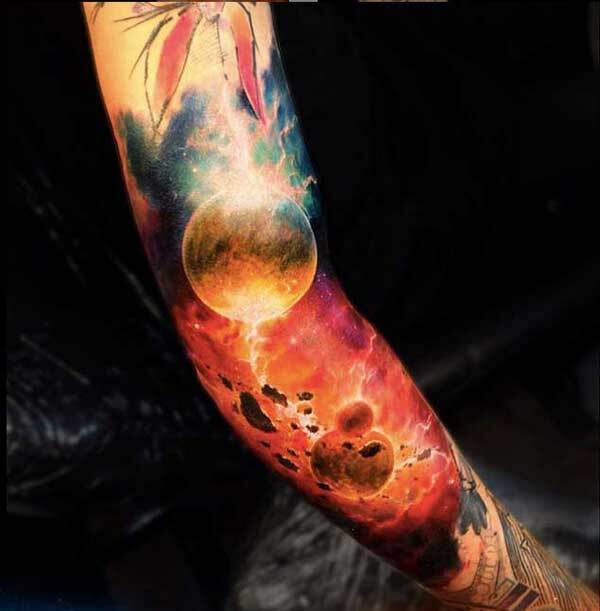 From various modern tattoo sleeve ideas and designs, the space tattoo designs are marvelous and delightful. These tattoos designs are great for both men and women. 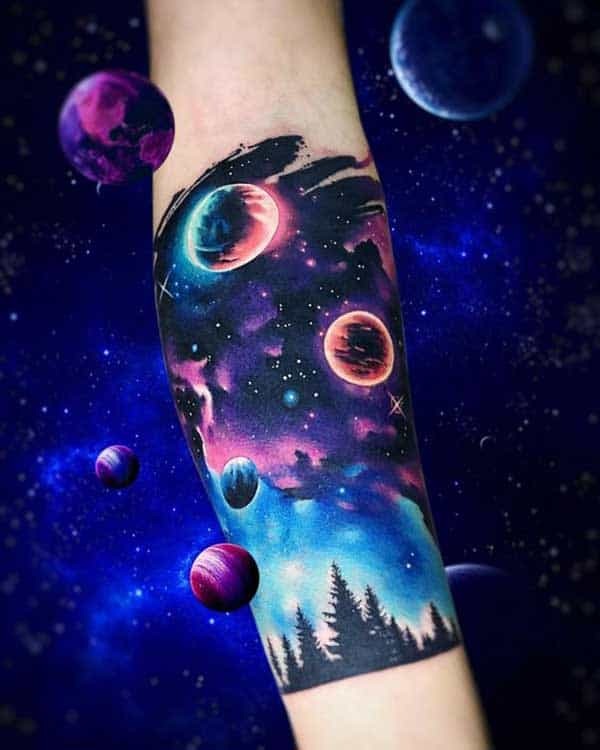 Various colors can be used to ink the Galaxy tattoo designs. The tattoo shows the unlimited beauty and power of the space which is yet not explored by humans. These tattoos are usually related to power and mystery. A mysterious person can surely get ink this kind of tattoo or can use this tattoo to express love for mysteries. The trees depict the destruction of planet Earth. The tattoo brings the destruction of forests to the limelight. Pocket watches were used by the Cowboys and it was a common accessory in the men’s fashion. It is much-loved tattoo design for its symbolic meaning. 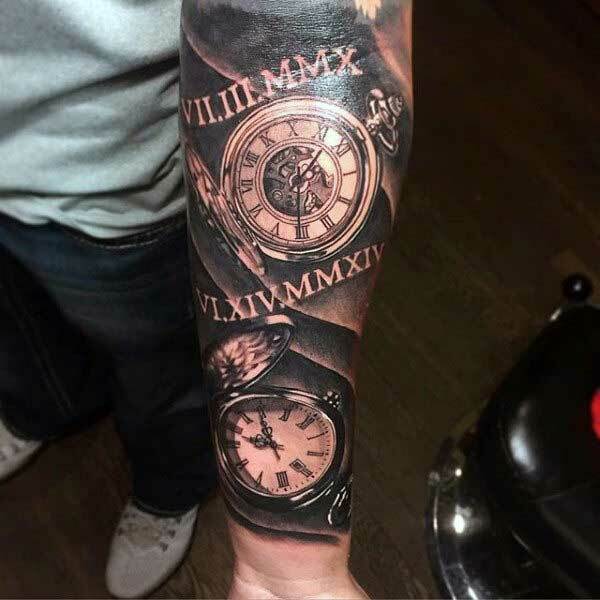 This tattoo sleeve ideas for men relates the importance of time in one’s life. It keeps pushing the person to live life to the fullest with each and every passing moment. 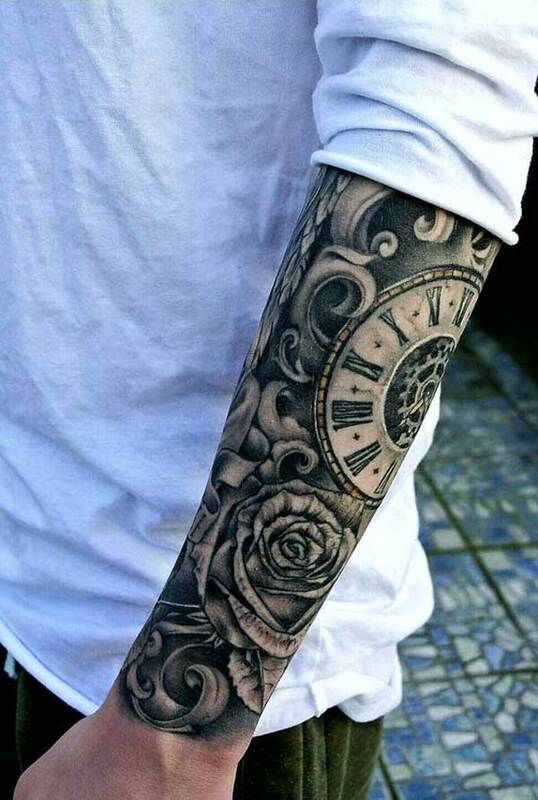 The pocket watch tattoo on sleeves is a style statement for many men and is one of the most loved tattoo designs in tattoo lovers. The detailed work of the tattoo design is lovely and looks so real. A beautiful flower, the rose is a symbol of true love. It is one of the most preferred tattoo designs by both men and women. 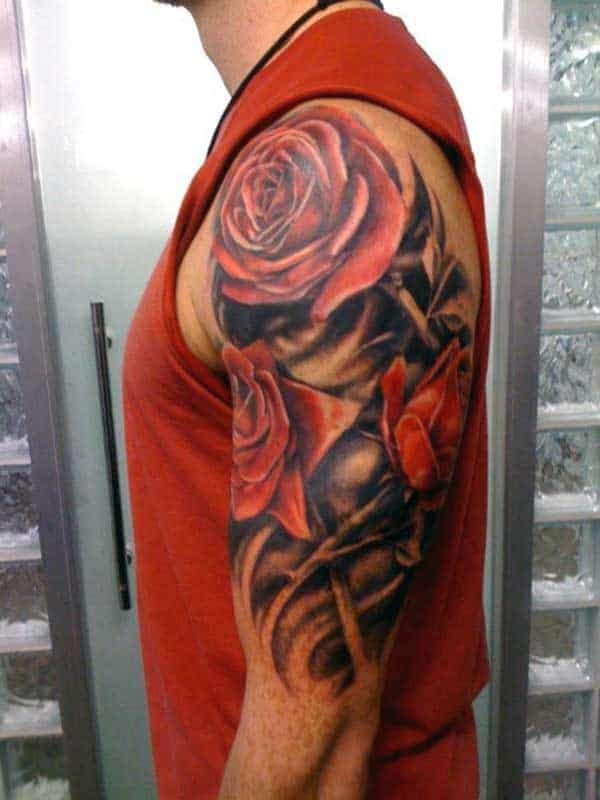 The roses, particularly without thrones, symbolize of a person in love or the tattoo is inked in memory of loving person. The beauty of rose flower tattoo symbolizes a new beginning, hopes, and feelings. It is also a symbol of peace brought by the brave the men after certain hardships. Lion tattoo is extremely beautiful and they can be blended with other designs flawlessly. The tattoos have different inspirations and have different meanings. A lion is a symbol of power and strength. Men love the lion tattoo to express their dominant nature or to show unique and noble persona. The lion tattoo is a symbol of leadership. 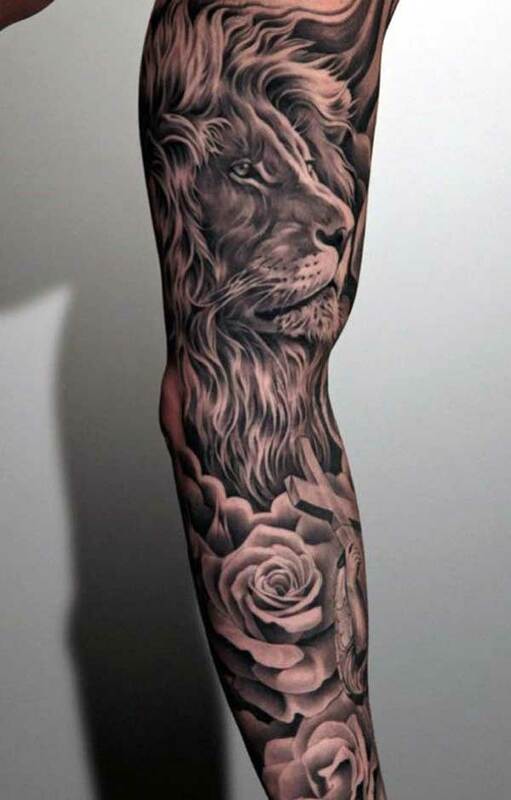 When a lion tattoo is designed with roses, it shows strength and love at the same time. The delicate and beautiful flower along with the powerful lion is a unique combination and shows a balance of strength and love. It is one of the rare tattoo ideas for men which boast beautiful design to be inked on the sleeve. The use of colored ink in this tattoo is awesome. The tattoo looks beautiful and artistic. The leaf motif is lovely and the design is becoming trendy. The right amount of colors just pop up the tattoo design and makes it breathtaking. The leaves are the symbol of constant change and evolution. The yellow, orange and red shades show different stages of life. The details in this amazing tattoo design are top-notch and make you think you could pick up the eaves right off the skin. An owl is known as a symbol of hope. An owl tattoo is elegant and stylish. The appearance of an owl is unique and the bird is precious as it is not easily found. 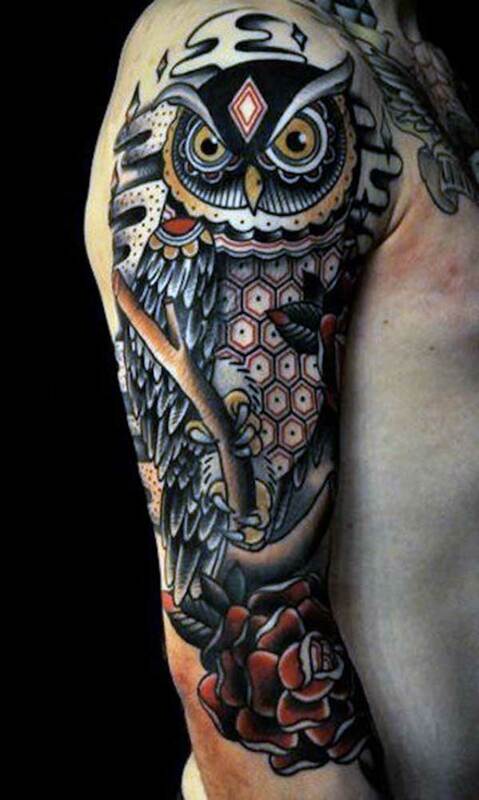 The owl tattoo is a constant reminder of widening our vision during the dark phase of life. Also, a bird tattoo is a symbol of freedom. Just like the birds that are free to fly wherever they love, the owl tattoo can be used to symbolize your freedom. Hence, it is a great choice for those who love freedom and vision. The owl tattoo can be designed with other designs. Usually, a rose flower with owl tattoo looks cool and beautiful. The beautiful masked lady sleeve tattoo is great in design. 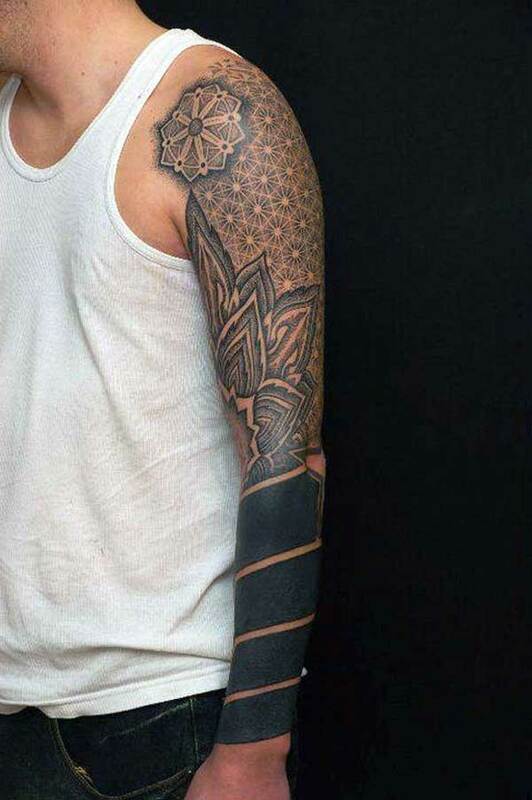 Fine attention to detail in the tattoo art makes it a perfect inked design. The tattoo looks very mystical and contemporary. The pocket watch dates back to the history of tattoos and cowboys. The shades and use of colors make it a perfect tattoo to be designed and inked on the sleeves. 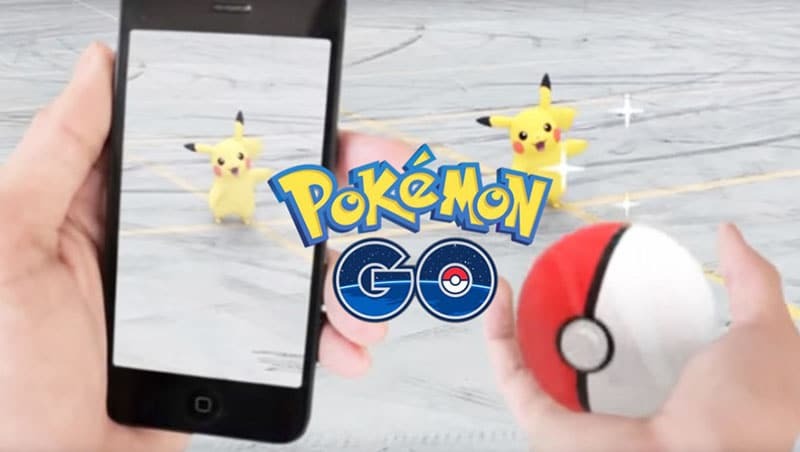 The 3 dimension art looks real and lively. The pocket watch below the woman is impressive. 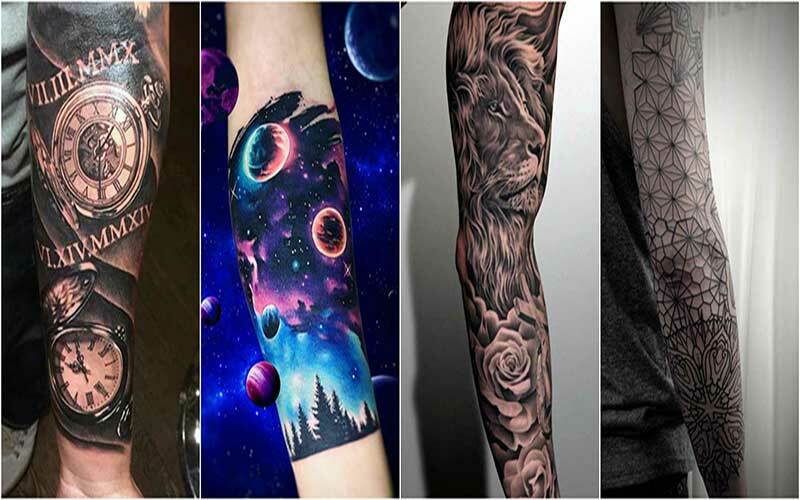 Hope the above-shortlisted tattoo sleeve ideas for men can help you sort a perfect design for your next inking session. More tattoo designs can be explored and meanings can be searched before finalizing any tattoo design. The permanent ink shows your emotions and the art expresses your feelings deeply. So, it is always advised to do to enormous research on your tattoo design before committing to the one.